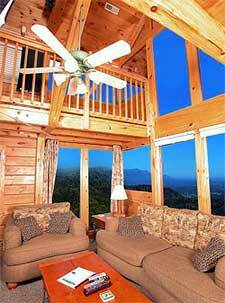 Timber Tops Cabin Rentals has some of the most popular and nicest log cabin rentals in Gatlinburg, Pigeon Forge or just about anywhere in the Smoky Mountains. If you are planning a Smoky Mountain, Pigeon Forge or Gatlinburg Vacation in the near future you will definitely want to check out the vacation cabins, chalets and log homes available at Timber Tops. You are in for a treat when you stay in one of their accommodations because they are filled with every amenity you can think of to make your vacation all the more enjoyable. For instance, take a look at the interior of the log cabin to the right to get an example of the luxury, views, cabin decor and comfort that await you at a Timber Tops Cabin Rental. Imagine just kicking back, lounging on the couch and staring off into the mountains. Does that sound like a great way to spend your vacation? The cabin featured above is called Bird's Eye View and it is a beautiful 2 bedroom 2 bath 3 level cabin that has some great amenities which includes a pool table, air hockey and electronic darts in the game room, a spiral staircase that leads to the loft bedroom featuring a 2 person Jacuzzi and a catwalk that leads to a private deck, a six person hot tub on one of the decks, a large screen TV with cable, a beautiful gas fireplace framed in rock, deck furniture and a beautiful beamed glass wall to let you see the incredible views from nearly anywhere in the cabin. And if you stay at Bird's Eye View you will be only minutes from Pigeon Forge with all the shopping, dining, fun, entertainment it has to offer. A short drive will get you into Gatlinburg with all of the attractions there and just further down the road is the Smoky Mountains National Park with all the hiking and adventure you can imagine. There isn't any way to enjoy your vacation more. Take a look at Bird's Eye View from Timber Tops Cabin Rentals. This luxury premier plus cabin rents for $280 to $360 per night depending on season and day of the week.